Should White Bread Be Eliminated From Our Diets? Bread is among the most commonly eaten foods worldwide. There are different varieties, shapes, sizes, textures, and ingredients of bread available on the market. A study published in PloS Med in 2007 states that high glycemic index foods, which can cause substantial spikes in blood glucose levels, can lead to an increase in risk of type 2 diabetes. Bread is among the most commonly eaten foods worldwide. There are different varieties, shapes, sizes, textures, and ingredients of bread available on the market. It is one of the oldest prepared foods. White bread is made from flour located in the central core of wheat. It is the most commonly consumed bread, but presents many health risks. White bread usually contains refined flour, which is reported to be associated with adverse health effects such as the onset of cardio-metabolic diseases. Many nutrients are lost during the refining process, e.g. calcium, iron, and B vitamins. White bread also has a high carbohydrate content; its starches are easily broken down and converted to sugar, which can significantly increase blood glucose levels. A research study published online in the year 2014 in BMC Public Health concluded that eating two or more portions of white bread daily is directly related to an increased risk of becoming overweight and obese. A study published in PloS Med in 2007 states that high glycemic index foods, which can cause substantial spikes in blood glucose levels, can lead to an increase in risk of type 2 diabetes. White bread has a high (70) glycemic index, which is a numerical measurement used to illustrate a food's effect on blood glucose. A high score means that more insulin is created and can aggravate type II diabetes. White bread contains phytic acid which has been illustrated in scientific articles to impair the absorption of minerals and other trace elements such as calcium, iron, and magnesium in the body. A study carried out by Bohn, et.al., published in the American Journal of Clinical Nutrition in 2004, supports this claim. 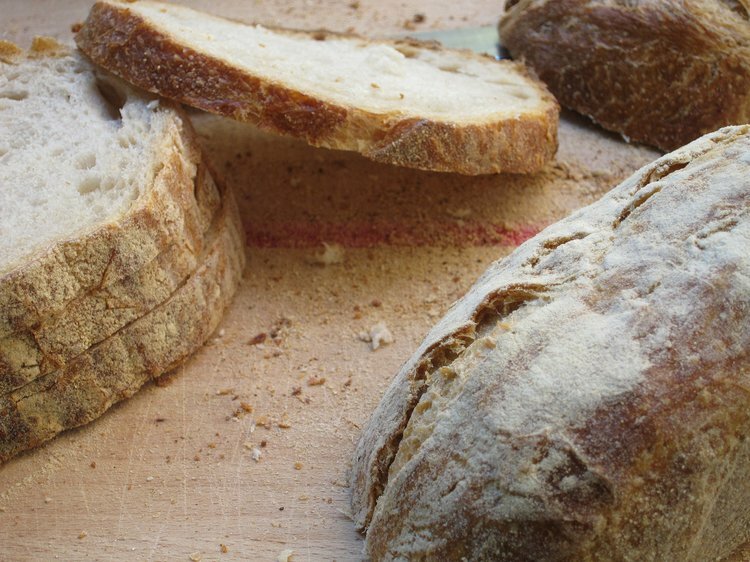 White bread may have adverse health effects, but not all breads are unhealthy. Consuming whole grain or multigrain breads can be beneficial. A study published in the Journal of Nutrition in 2015 found that enriched cereal based breads contribute to the reduction of hunger by increasing the feeling of satiety. It also illustrated improved responses to glycemic, gastrointestinal, and insulinemic hormones in healthy adults, which basically means it is healthful. There are different types of breads available in the market that could be considered healthy such as whole wheat, brown, and multigrain bread. The USDA recommends the replacement of refined foods with whole grain foods. Whole grain and multigrain breads contain various vitamins and minerals along with fiber. These breads also help to reduce blood cholesterol levels. On the other hand, compared to a whole grain bread like whole wheat bread, white bread lacks 30 essential nutrients and also contains added sugars (i.e. empty calories). Bread is part of the daily diet of many cultures and making healthy bread choices is essential. The kind of bread consumed could make all the difference to the overall health of an individual. Making heathier bread choices, as several studies show, could potentially lead to a decreased risk of heart disease and type II diabetes.